The tops and the skirt are designed for soft woven fabric. We suggest challis, cotton, silk, crepe, rayon, or washed linen. The contrast fabric in VIEW B can also be made in sheer fabrics such as organza, chiffon, or voile. The pull-on skirt has high slits in both side seams and self-fabric drawstrings with elastic in the casing at the waist. The loose fitting pull-over tops have extended shoulders and a slit at the center front. View A top has a faced round neckline, side slits and self-fabric drawstrings with elastic in the casing at the waist. View B top has a hood. The bands at the bottom edge and the sleeves are made from contrast fabric. I love Kwik Sew patterns. The instructions are characteristically easy to follow. I wanted a basic straight skirt pattern, and this one filled that need. The side slits are cut a wee bit too high for me. However, the slits on the finished skirt are exactly as pictured on the pattern envelope, so I could have altered the pattern. I wasn’t thinking about it. I made the skirt out of brown 100% slinky knit. I haven’t made one out of a woven. I don’t think it’s a great pattern for a stretchy knit. Maybe if I had had my coffee before ordering the pattern, I would have noticed it wasn’t for knits. I recommend it for a basic straight skirt, and I plan on sewing it again. 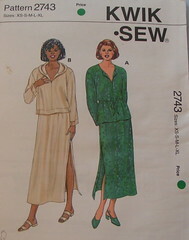 Kwik Sew patterns are reliable with excellent instructions. This basic style sews up in minutes (not counting cutting). It’s a nice pattern.